The Hindu nationalist ran on a platform of “good governance.” What will happen now that he’s won? How does a man go from being an international persona non grata to a friend of powerful Western leaders? Widely criticized for presiding over the ghastly 2002 religious massacres in Gujarat while serving as the state’s chief minister, Modi was denied a visa by the United Kingdom and other EU countries. Nearly 800 Muslims and over 200 Hindus died in the upheaval, and an opposition politician, Ehsan Jafri, was killed and set on fire in front of his wife. Modi’s own role in fomenting the violence is still under a judicial examination that may now be stymied. A special investigation team, itself accused of being compromised, is often cited by his supporters as having issued Modi a so-called “clean chit.” In actuality, the team reported that there was insufficient evidence of Modi’s direct involvement in events to be able to prosecute. Modi’s rehabilitation and consequent electoral victory—though he only carried 31 percent of actual voters and just over 20 percent of the entire electorate—are undoubtedly the result of what a supportive Indian newsmagazine, whether through a staggering lack of awareness or as sly satire, describes on its cover as a “Triumph of the Will,” echoing, of course, Leni Riefenstahl’s infamous ode to Hitler. There’s a curious honesty in this allusion, since it invokes a comparison that frequently rankles Modi supporters and the extreme-right Bharatiya Janata Party (BJP) to which he belongs. Modi’s lifelong membership in the Rashtriya Swayamsevak Sangh (RSS), a militaristic organization whose founders openly admired Nazism, is no secret. Nor is Modi’s espousal of that form of Hindu extremism known as “Hindutva,” which insists that India is a nation for Hindus. The term “extremist” riles his supporters, for whom it ought only be attached to “Islamic,” but both Hindutva and many Islamist extremisms have more in common with one another and with ideologies of Western imperialism than they admit. All share a commitment to civilizational superiority and the subordination of minorities, and a willingness to use violence to control people and resources when they fail to gain consent. Understanding Hindutva’s acceptance of violence is important because Modi’s liberal observers often separate his commitment to neoliberal economic growth, which they support, from his brand of Hindu extremism, which makes them squeamish. Modi’s most successful election strategy was to bill himself as a “man of development” who would boost India’s desperately unequal economy to stratospheric heights with benefits for all. This passionate commitment to free markets is not unrelated to Modi’s authoritarian personality. The next prime minister’s appeal is a composite: unapologetic man of action, with a fabled “56-inch chest,” not held back by either effeminate political correctness or pesky state regulation. Modi, like many elite Indians, idolizes China for pursuing capitalist growth without the obstacles thrown up by democracy. Modi’s claim of sole responsibility for double-digit growth in the state of Gujarat is disputed—the state was already doing well by these indices, which are also replicated elsewhere in India. But Gujarat also suffers from abysmal child nutrition (which Modi blamed on girls’ dieting) and ranks unimpressively in educational attainment and other human development indices. Modi’s mythologized “Gujarat model” of development has also created deep environmental damage in the region and caused the displacement of the rural poor by new factory buildings. A less impressive statistic that has rarely made the news is the high rate of farmer suicides in Gujarat, with about 5,000 in less than ten years. For all that he promises “good governance”—a welcome prospect to Indian voters fed up with the corrupt Congress Party—there are sobering accounts of Modi’s authoritarian style, his bypassing of democratic process and giving large corporations sweetheart deals and huge subsidies. Those corporations in turn have supported the Modi campaign handsomely. If the Gujarat model is to be replicated nationally in the next five years, expect some staged “moderation” on the religious front—violence can be bad for big business, after all—but also the scrapping of what small welfare measures are currently in place in India. 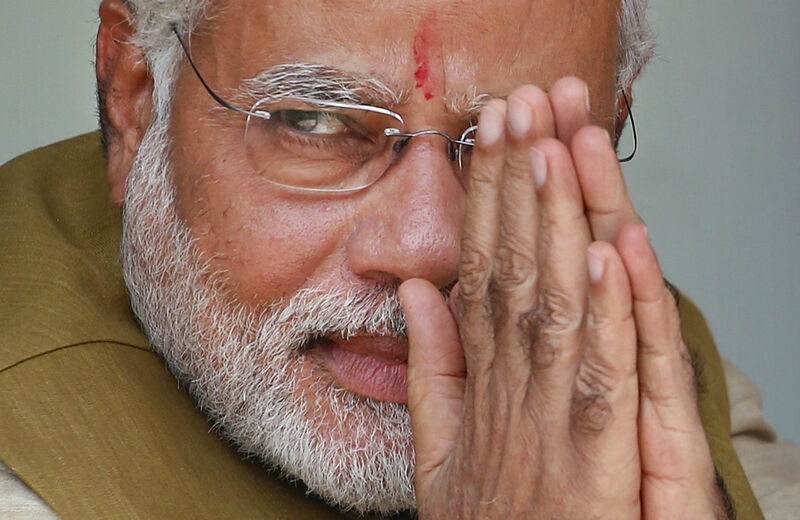 The Hindu middle class may become increasingly prosperous, with more private-sector jobs, better investment returns and increased spending power, but Modi, already compared to Thatcher and Reagan for his fabled “Modinomics,” is likely to provide minimal poverty alleviation, more environmental degradation and further backsliding for already economically disenfranchised Muslims through a lack of protection from active discrimination in jobs, housing and welfare measures, and a refusal to provide affirmative measures for “pampered minorities.” With rising tensions in Kashmir and with neighboring Pakistan in response to Modi’s history of anti-Muslim rhetoric, there’s little about which we should be complacent. In the United States, Modi’s victory was celebrated loudly in Times Square by Hindu Americans, many of whom lent his campaign extraordinary support. Embracing a retrograde brand of Hindu extremism serves to shore up the cultural identity for many Indian-Americans as they assimilate swiftly as members of a “model minority” in the States. The spread of Hindu extremism in India is in no small part due to the handy assistance of émigré donations, known as “the saffron dollar.” While correctly reporting a massive anti-incumbent wave against the abysmal ruling Congress Party, the Western media have, on the whole, taken remarkably little cognizance of the specific nature of the grave transformations on the Indian political landscape. To describe these as “creeping fascism” is not an overstatement. Most liberal Western journalists have noted Modi’s stained record as something of an uncomfortable question mark, while stressing his “charisma,” his “brilliant” campaign and ability to connect with “aspirational India,” to which the hackneyed “rise-from-nothing” story, from tea boy to prime minister, has been central. This sudden celebration of a working-class hero is not in itself surprising; Western politicians and mainstream media often allow money to determine who is an extremist (Hamas in Palestine) and who isn’t (Wahhabi Saudi Arabia). Right now, the purse strings and corporate contracts are Modi’s. True progressives in the United States and beyond, however, must ponder the consequences of their own leaders’ new and dangerous bedfellow. Priyamvada GopalPriyamvada Gopal is a professor at Cambridge in the UK.